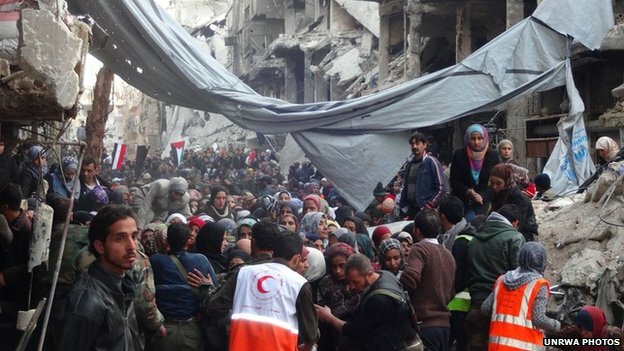 The Yarmuk refugee camp, in the suburbs of Damascus, has been especially hard hit during the Syrian crisis. It holds over 100,000 Palestinians, trapped there since they were expelled from Israel in 1948. Allowing them to return to where they came from, would be a big help in the current Syrian refugee crisis. Posted in Canadian Politics, Conflict, Discrimination on December 21, 2014 by Peter Larson. 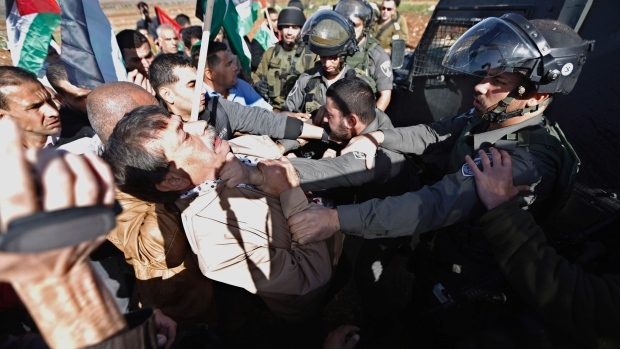 Palestinian Government Minister Ziad Abu Ein scuffles with Israeli police at a demonstration on December 9th shortly before his death. He was unarmed. A longtime leader of Palestinian civil society groups, Mr. Ziad had been appointed this year to head a government-backed protest group, the Committee to Resist Settlements and the Wall. 161 countries vote to ban nuclear weapons in the Middle East. 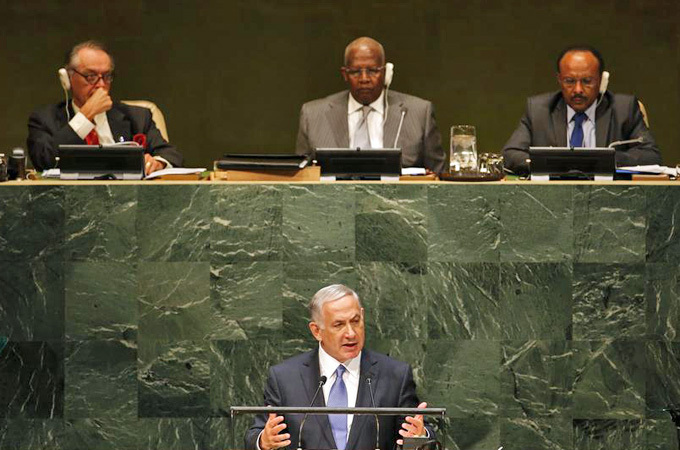 Six countries oppose the resolution. Guess who? On December 2nd, The UN General Assembly approved a resolution (161- 6) calling for a ban on nuclear weapons in the Middle East. Only six countries opposed the resolution. They were Israel, the USA, Canada and two other countries. Posted in Canadian Politics, Palestinians on December 10, 2014 by Peter Larson. Why would a Canadian have “Palestine in the heart”? I was recently asked to make the keynote speech at the annual meeting of the Jerusalem Community Services of Ontario (JCSO), a Palestinian community organization. The title of the event this year was “Palestine in the Heart”, and I felt privileged, as a non-Palestinian, to be invited. It was a fun event, with a large crowd, perhaps 200 people. The tone of the evening was both cheerful and nostalgic and featured many cultural events – poetry reading and a little play reminding people of various areas of Palestine – Jaffa, Haifa, Nablus, Hebron and of course, Jerusalem. I was one of 2 guest speakers and was invited to talk about whatever I wanted. As I prepared for my address, I reflected on the evolution of my own thoughts regarding where truth and justice lie in the difficult Israel/Palestine issue. If you are interested in my speech, please read on. 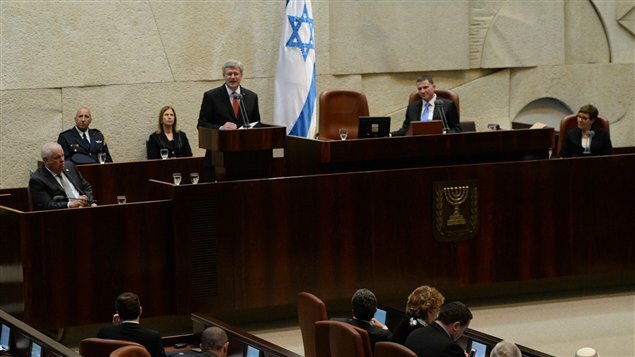 “Our view is that Israel’s right to exist as a Jewish State is absolute and non negotiable” – Stephen Harper speaking to Israeli Knesset.